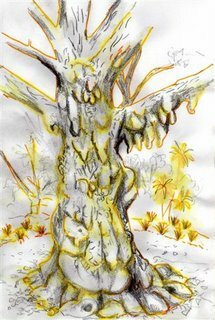 Photos, drawings, paintings from Peceli and Wendy of an old Ginkgo in Geelong gardens, Australia. Well, now I know the page you found on our blog! Lovely to see your website devoted to this fascinating tree. The Dalai Lama had a prayer vigil at the Geelong Botanical Gardens when he visited and now the surrounds are called the Peace Garden. Our babasiga website is about Fiji and the geelong-visual-diary is mainly about our Australian city.